I got a big new work project and have traveled on five work trips in the last four weeks. It’s been insane. Then at least I’m posting something. And I can do it in my “free” time during taxi rides & layovers & such. (This project & my travel will last into 2018.) And if days magically get 28 hours in them or I have a normal free moment then maybe I’ll squeeze in a “regular” style post when if can. But maybe this middle ground can work for now? Thoughts? I wore this outfit for a executive planning meeting with the higher ups at my new client. 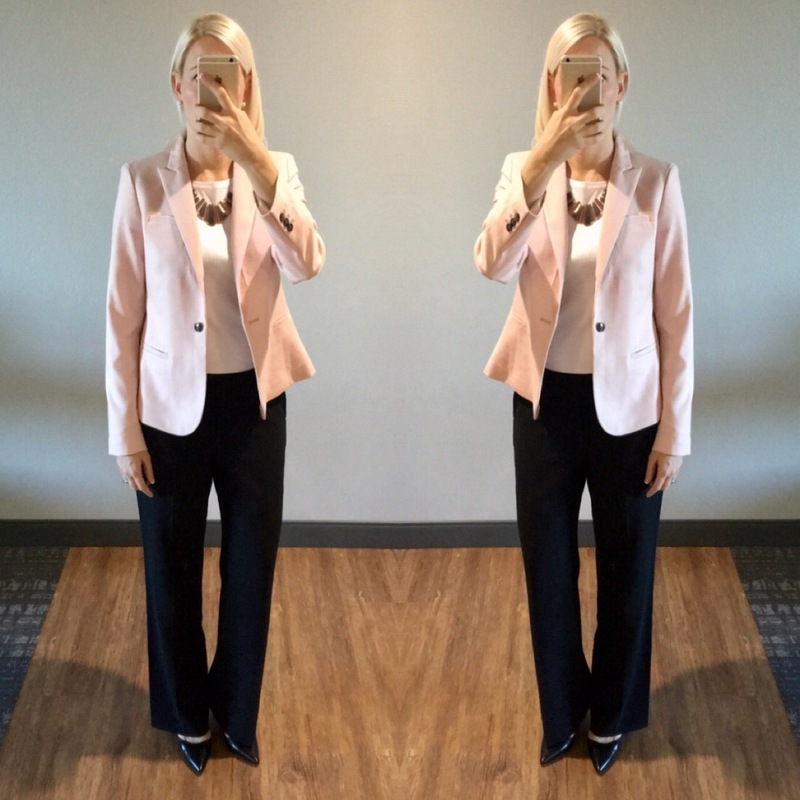 Pink blazer is new from Banana and I am sort of in love with it! Ok – I lied – here’s a link to the blazer. Love it! I definitely stop by for the photos. I’m outside the US so shopping links don’t really work for me a year! I haven’t worked in a corporate environment for 4 years but still love to see what you’re wearing/how your styling and generally marvel at the depths of your closet! I like the new approach! I don’t tend to make use of the celebrity inspirations. And if we really like the outfit, we can do the research for similar pieces! I can’t imagine all that travel you have going on! Yes because I miss your posts! Your corporate looks work well for my small office as well. Yeah for updates! I like to see your pictures, don’t care as much for the inspiration picture…they aren’t really doable in the real world, imo. You always made them work appropriate. So your pictures are the good ones. 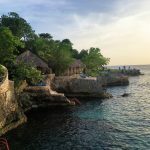 As I start a new job, where it looks like I will be traveling a lot more, I’m going to rely even more on your blog. So thankful for it!Good luck with the new project. PS. Love this jacket also. might have to get it, though I would never have thought I would be interested, this makes it look SO easy! and just a PS…J Crew needs to hire you because you make this blazer look SO much better than the store does. I would not have looked twice at it, and now I am because of your post! Yay! Good luck on your new job! I’ve missed your posts so much! I have very similar pieces in my wardrobe and you put together combos I wouldn’t think of so I love seeing what you’re wearing. I do find the links interesting but not necessary all the time. I really just miss seeing your outfits! I’m really going to try to find a posting rhythm! Thanks! Love pale pink for any season! Congrats on the project! The new format will be fine! There is a season in life for everything and it makes sense to streamline in this busy time of your life. I have missed your posts so am glad to see your cute outfit! Things always look better in you than in the store websites! Good luck with your work project and juggling your commitments. I like the links but I also pretty much follow for the pics! They definitely give me inspiration to get out of my work clothes rut! Like it. Just look forward to your posts and if this works best for you, that’s good. Love the pink blazer. Thinking of getting one too–very versatile for work or casual wear. Thanks! I love this one. More then I expected. Hope you find one & love it too! I like the idea! Although I like seeing your creative inspirations, this new idea fits your busy schedule. Your posts are so helpful to me! I agree with everyone, pics of your outfits are what I love most! 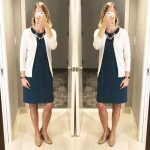 I am corporate IT and have the same dress code so I love having inspiration! I love the pics, so whatever works for you works for me! I am a professional mom of three boys and I really appreciate your easy-to-copy corporate outfits and your fun casual looks! Yes this is great, the photos are what I use also. Congrats on your new project! I forgot to add Your outfit ideas are awesome! I’m a corporate mom of an almost 2 year old and am in compliance so these all work well! Thanks for representing us mid 30s ladies so well! Yay! So happy to hear you find the outfits useful! Please keep posting! Love your style. I am an engineer at a local government agency that is mostly business casual. I did enjoy your shopping links because you post a lot of items that work with my budget but I understand that you can’t keep it up now. I hope you get back into posting them! I have missed your posts! I do use the links, especially for anything currently available and have tried several new brands because of your posts. 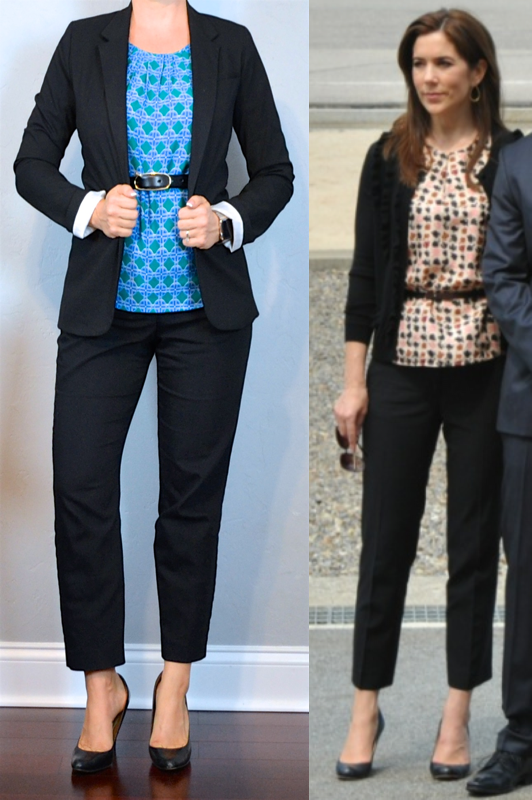 Your blog has pretty much transformed the way I dress for work (and I get many compliments). But, if no links mean we get posts for now, I will live. Inspiration pics are not important to me. Good luck on your project, sounds stressful! Absolutely, we love seeing your outfits. Post links when you can, but show us the outfits! I’m so happy to see a post! Yes, love it! Thank you so much for taking your time to inspire us! Omg! I think I saw you in downtown Dallas one morning in this pink blazer outfitt! Maybe, anyway if not yall are both stylish! I like the new approach too. I’d rather this than nothing, of course! Whatever you can manage. Loving the light pink blazer! 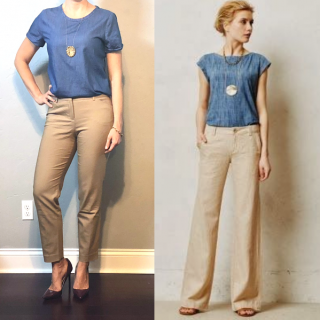 I’ve been looking for light pink ankle pants, and found some winners in Old Navy’s ‘Harper’ pants!